Brief Description: Measuring less than 0.5 inches high and 1.25 inches wide, the Reef Brite Lumi Lite looks as great as it performs. 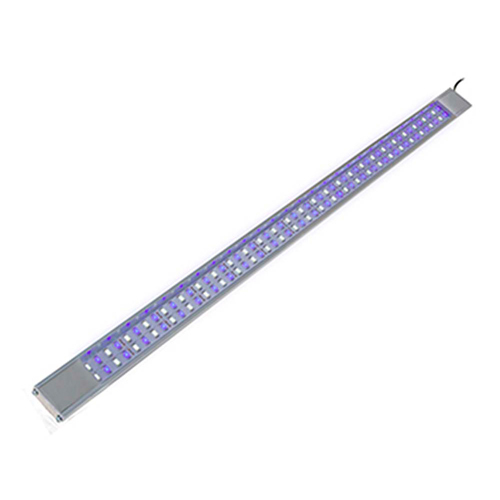 Featuring a high power LED array, the Lumi Lite promotes growth while enhancing color in corals, invertebrates and fish. Notify me when "Reef Brite 72 in. White Lumi Lite LED Strip" is re-stocked. The Lumi Lite is available in a wide variety of configurations to suit marine/reef and freshwater applications. The Lumi Lite includes power supply and mounting legs and is compatible with popular LED ramp timers. Lumi Lite Recommendations - What should you purchase? A single Lumi Lite 50/50 assuming the length of the fixture is equal or almost equal to the length of the tank. A single Plant Lyte, again assuming the length of the fixture is equal or almost equal to the length of the tank. For high light demanding plants you might consider a second unit. Either two 50/50 Lumi Lites or a single white and a single blue actinic. You might also consider using a Lumi Lite Duo which can be connected to a Current USA Ramp or Fluval LED timer, with the Lumi cable adapter kit that is sold separately. For more light demanding corals a third unit can be used. The Lumi Lite series makes a great replacement light for customers using the stock LED units included with their tank purchases or similar imported units. For larger set ups you may need additional units or consider using Reef Brites Tech or XHO LED series.